Leonardo DiCaprio and Mariah Carey? Cher and Tom Cruise? BUT THEY LIKE REALLY DATED?! In his new book, Ryan Casey has gathered together the strangest, most surprising, and downright odd mating and relating habits of the denizens of Hollyweird in this four color, fully illustrated extravaganza. After tweeting a portrait of Andy Cohen during a Watch What Happens Live episode, Andy Cohen later featured it on the show and it turned into the branding for the hit late night chat show. Ryan’s popularity continues to rise with thousands of new followers a day to his website and after becoming a Bloggie winner and a Webby Award nominee, BUT YOU LIKE REALLY DATED?! is the perfect follow up to his online success. 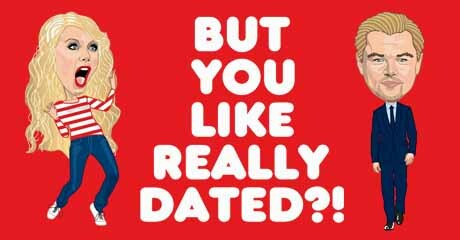 With amazing trivia about celebrity hookups, breakups, and makeouts, BUT YOU LIKE REALLY DATED?! is filled with Ryan’s commentary and signature drawings. He brilliantly captures Amanda Bynes, Justin Timberlake, Honey Boo Boo, Taylor Swift and others with hundreds of spot-on illustrations. His razor-sharp commentary and amazingly detailed illustrations makes BUT YOU LIKE REALLY DATED?! the funniest and most visually exciting book this fall. BUT YOU LIKE REALLY DATED?! has page after page of Ryan’s snark, signature illustrations, and amazing attention to detail. It’s hard to keep up with all of the romantic behavior of celebrities, but lucky for you, Ryan has documented all of the hookups and breakups in glorious, full color illustrations. And other odd couples, with a decade-by- decade breakdown! Beautifully designed and dead-on hysterical, But You Like Really Dated?! is perhaps the funniest book you’ll read this year!